Cotton farmers are using the cash assistance from the government’s Rythu Bandhu scheme as a form of compensation for their losses. In November this year when L Mallesh from Madipally village of Karimnagar district lost the Rs 15,000 he had invested in cotton farming, his loss was buffered by the Rs 12,000 he got for his 3-acre land through the state’s Rythu Bandhu scheme. 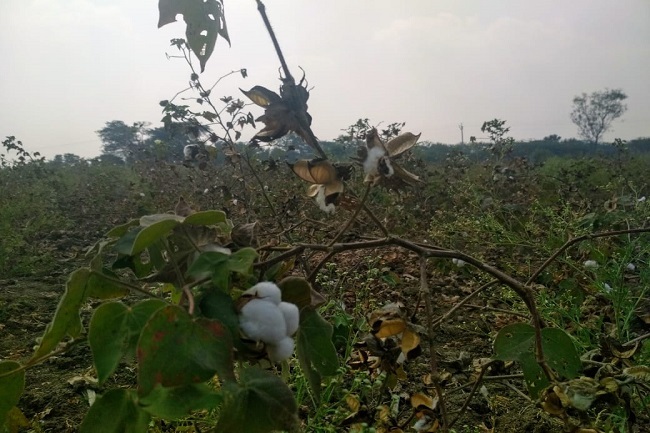 Cotton farmers in and around Jammikunta mandal under the Huzurabad assembly constituency are reporting widespread crop losses and low yield this rabi season. However, farmers are using the investment support extended under the Rythu Bandhu scheme as a form of compensation for their crop loss. Also known as the Farmers’ Investment Support Scheme (FISS), Rythu Bandhu was launched in February this year by the Telangana government. The scheme provides financial assistance of Rs 4,000 to land owning patta farmers for every acre they own. The state government had allocated Rs 11,925 crore in the 2018-19 budget for the scheme. The scheme is, however, not extended to tenant farmers. “I sowed cotton in 1 acre with an investment of Rs 15,000 just last month… it’s all gone now. The leaves shrivelled up turning red first and then brown before dying,” said Mallesh, who with his wife Kavitha was readying another acre to sow corn. “I am facing losses for sure, but the Rythu Bandhu scheme has helped mitigate that loss a little, but a loss is still a loss,” he added. Even though the TRS government’s flagship scheme has helped Mallesh stem his losses, he is still unsure if he should vote for the party. “Instead of giving cash, why can’t they give subsidy on pesticides or fertilisers or even seeds? These are the farming items that have become costly over the years,” said Mallesh. Agreeing with her husband, Kavitha said, “The Rs 8,000 a year just gets spent on some household expenses, but so far none of the political parties have spoken anything about a subsidy.” Though the farmer couple got their second instalment of Rythu Bandhu assistance in November, they invested in the cotton out of their own pocket. However, unlike her husband who is an undecided voter, Kavitha intends to vote for the TRS. “They are okay, at least they are doing something,” she added. Though Rs 5,925 crore was released in the first week of October for the second phase of the investment scheme, there was a delay in cash deposit to the farmers’ bank accounts. This has impacted how the farmers spent their money. This delay in payment to the farmers was forewarned by the Principal Secretary for Agriculture, C Parthasarathi, in early October itself. He cited “problems in cash management and a shortage of staff as the revenue department was busy with election work” as the reason for the delay. The payments were to be delayed by four to six weeks. Adjacent to Mallesh and Kavitha’s land was farmer T Aravind piling up a mound of dead cotton. The youth along with his parents had sowed cotton in their 3 acres of land in November. The SC youth, who has a diploma in electrical engineering, took to farming after his wait for a government job turned futile. “We spent Rs 1 lakh on cotton farming, that’s without the labour charges. I took to farming so as to minimise the labour cost, it will lower my father’s burden,” Aravind said. “We are getting only 4-5 quintals of cotton per acre. Reports about low yield are coming from all regions growing cotton in the state, no region has been spared,” he added. Aravind and his family got Rs 20,000 through the Rythu Bandhu scheme in the last week of November, mitigating some of their loss. Aravind’s father, T Rajendar, is also of the view that the Rythu Bandhu scheme would be more useful as a subsidy for farm inputs than as a cash incentive. As the family burnt their cotton, they decided to sow corn next. The decision was taken despite being aware of reports about the attack on corn crops by fall armyworms (Spodoptera frugiperda) across Telangana. Aravind is now banking heavily on another 2 acres of turmeric to sail him through until he gets a government job with steady income. “The TRS government promised 1 lakh jobs but they couldn’t deliver. But I am willing to give them one more chance to deliver on that promise, giving so many jobs in just four years is not an easy task,” said the first-time voter from Jammikunta mandal of Huzurabad constituency where the state’s finance minister Etela Rajendran won the 2014 state elections. As an agrarian crisis looms large in his backyard, Etela will be taking on Padi Kaushik Reddy from the Congress on December 7 at the polls.